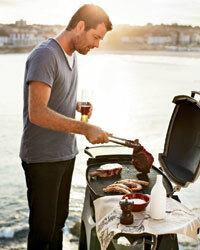 With his new cookbook, My Grill, Australian chef Pete Evans is exporting his can't-mess-it-up style of food to America. Here, a preview. It's just another gorgeous morning on Sydney's Bondi Beach. Surfers are making the most of the waves while a handful of swimmers power themselves through the turquoise water. At the door of his apartment just feet from the sand, Australian chef Pete Evansfresh from the surf, dressed only in a striped towelis inspecting boxes of ingredients for a day of grilling. "When you step outside to cook, everything seems to just..." and then Evans sighs, letting his shoulders go slack. "It really just takes the pressure off." Evans is one of the country's most successful young chefs, with a string of loungey, modern Australian restaurants and a top-rated television show. A lifelong surfer, he's almost as likely to appear on TV in board shorts as in chef whites. "When I was a kid, I would bike 30 minutes to get to the beach every morning," he says. He bought his apartment on Bondi when he opened his first Sydney restaurant, just down the road, in 1996. He's especially fond of Thai, Chinese and Indonesian flavors, as evidenced by his grilled shrimp with a sweet-and-sour sauce that mixes ketchup with fish sauce, hoisin, cilantro and mint. Or his Balinese grilled chicken smeared with a garlic, ginger and turmeric rub. "I stole that dish from a housekeeper I met on a surfing trip to Bali," says Evans, permanently tan from living on the beach for 15 years. He still travels a lothosting guest-chef dinners in Park City, Utah; surfing in Fiji; fishing in the Australian outbackbut he's now focused on staking a claim in the US. With his cookbook on shelves here and an American TV show under discussion, he's trying hard to export what he calls his "humorous, informative, not too serious" approach: "I'm not a snob or a purist." 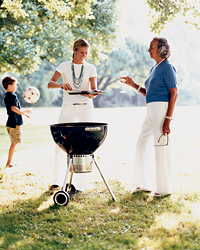 These delicious, doable grill recipes epitomize what Evans is all about. That and the board shorts.